On Saturday 5th August, five innocent civilians were martyred and injured in the indiscriminate shelling of internal stooge forces in ‘Saroza’ village of ‘Saroza’ district in ‘Paktika’ province. On Monday 7th August, two civilian countrymen were relentlessly martyred by the internal mercenary forces in the outskirts of ‘Shindand’ district in ‘Herat’ province. On Tuesday 8th August, a civilian countrymen was martyred and two more were injured during a raid of the savage foreign invaders in collaboration with their internal mercenary forces in ‘Mamli’ area of ‘Khogyani’ district in ‘Nangarhar’ province. On Thursday 10th August, sixteen innocent civilians were martyred in the indiscriminate bombing of savage foreign invaders in ‘Paeen’ area of ‘Haska-Maina’ district of ‘Nangarhar’ province. ‘Saz Wali’, the governor of ‘Haska-Maina’ district confirmed the incident and added that a civilian vehicle carrying 8 passengers was targeted and hit, in addition to ordinary 8 way-farers, by brutal foreign invaders in an air raid, and all of them were martyred. 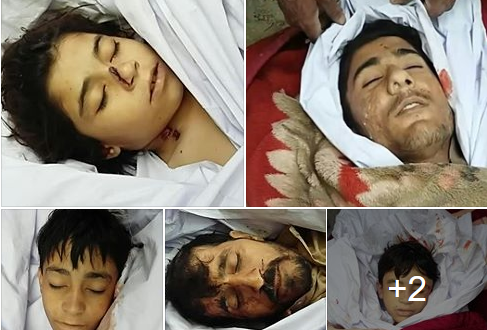 On Friday 11th August, twelve children and two women were martyred while three other civilians were injured in the random artillery shelling of internal stooge forces in ‘Torta-Ata’ area of ‘Dolat-Abad’ district in ‘Faryab’ province. On Friday 11th August, civilian houses in ‘Momin Abad’ area of ‘Imam Sahib’ district in ‘Kunduz’ province were relentlessly bombed by the internal mercenary forces, in which, four civilians were martyred and injured. On Friday 18th August, two children were martyred while their mother was injured in the indiscriminate mortar shelling of internal stooge forces in ‘Ganjgal’ area of ‘Sarkano’ district in ‘Konar’ province. On Sunday 20th August, five innocent civilians, including children and women, were martyred and injured in an ambush of the internal stooge commando forces in the central bazaar of ‘Bala-Murghab’ district in ‘Badghis’ province. On Sunday 20th August, civilian houses were raided by the brutal foreign invaders in collaboration of their internal mercenary forces in ‘Navaqulo’ area of ‘Bati-Kot’ district in ‘Nangarhar’ province, in which, significant amount of valuables were looted from the houses, and then, three innocent villagers were relentlessly martyred. On Monday 21st August, a civilian (named ‘Mohammad’s/o ‘Ali’) was ruthlessly martyred by the notorious Arbaki militiamen in ‘Gore-Aghli’ area of ‘Shirin-Tagab’ district in ‘Fryab’ province. On Monday 21st August, ‘Char-Darchiyan’ village in ‘Gore-Tapa’ area near the center of ‘Kunduz’ province was raided by the savage foreign invaders escorted by their internal mercenary forces. In this brutal raid, first the main gates of several houses were blasted; the local people were then badly beaten, while four innocent civilians were taken away as prisoners. On Wednesday 23rd August, three civilian people were martyred and injured in the indiscriminate drone strike of the savage foreign invaders in ‘Janjai’ area of ‘Said Abad’ district in ‘Maidan Wardak’ province. On Saturday 26th August, eleven civilian countrymen were ruthlessly martyred in the indiscriminate drone strike of the savage foreign invaders in ‘Nahr-i-Sofi’ area of ‘Char-Dara’ district in ‘Kunduz’ province. On Sunday 27th August, civilian houses were raided by savage foreign invaders collaborated by their internal mercenary forces in the ‘Sajani’ area of ‘Char-Dara’ district in ‘Kunduz’ province. In this brutal raid, first the main entrances of several houses were blasted by bombs; the innocent people were severely beaten, and their valuables were looted. Eventually these houses were indiscriminately bombed, in which, a number of houses were destroyed, while five women and children were martyred and injured. On Monday 28th August, a civilian (named ‘Haji Khuda Dad’) was martyred in the random shelling of internal amateurish soldiers in ‘Koka-Balaq’ area of ‘Eshkamish’ district in ‘Takhar’ province. On Monday 28th August, forty innocent civilians, most of them women and children, were martyred in the ruthless bombing of the savage foreign invaders in ‘Bakht Abad’ area of ‘Shindand’ district in ‘Herat’ province. ‘Jilani Farhad’, the spokesman of governor of this province confirmed this tragedy to BBC by adding that mostly women and children were martyred in this untoward incident. On Tuesday 29th August, a religious scholar (named ‘Moulavi Abdul Hakeem’) was ruthlessly martyred after the evening (second last) prayer of the day inside the mosque by the unrestrained Arbaki militiamen in ‘Khogyani’ district of ‘Nangarhar’ province. On Tuesday 29th August, thirteen innocent civilians were martyred while seven more injured in the ruthless and indiscriminate bombing of savage foreign invaders in ‘Dasht-i-Bari’ area near the central city of ‘Logar’ province. Carol Anne Grayson is an independent writer/researcher on global health/human rights and is Executive Producer of the Oscar nominated, Incident in New Baghdad. She is a Registered Mental Nurse with a Masters in Gender Culture and Development. Carol was awarded the ESRC, Michael Young Prize for Research 2009, and the COTT ‘Action = Life’ Human Rights Award’ for “upholding truth and justice”. She is also a survivor of US “collateral damage”.